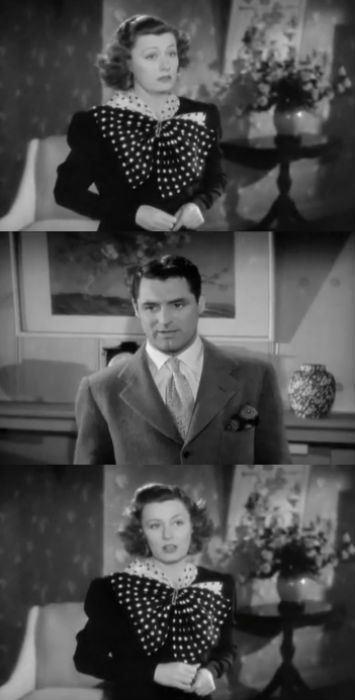 Irene Dunne and Cary Grant made three pictures together. Far too few for this fan. Those were, Leo McCarey’s, The Awful Truth (1937), Garson Kanin’s, My Favorite Wife (1940) and George Stevens’, Penny Serenade (1941). 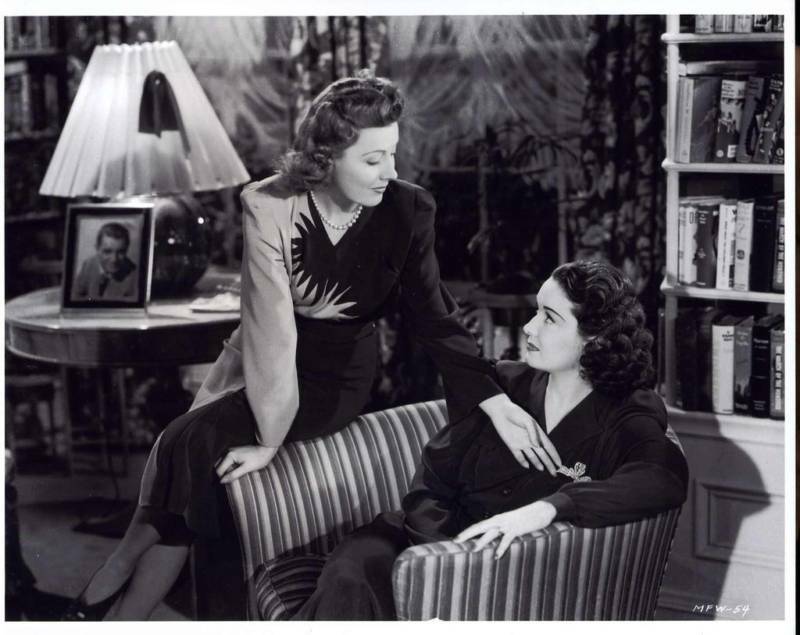 The first post I ever did for a blogathon was on their first collaboration, which happens to be one of the best screwball, romantic comedies ever made. If interested, you can take a look at that post here. Of The Awful Truth here I’ll say only that it shouldn’t be missed. It’s a hilarious romp about a married couple who are divorcing but can’t quite get out of each other’s lives. Screwball doesn’t do it justice nor is it easy to say nothing else about it. But, today I am focusing on the other two films that star Grant and Dunne, completing the trifecta – a great one – and on their wonderful chemistry. 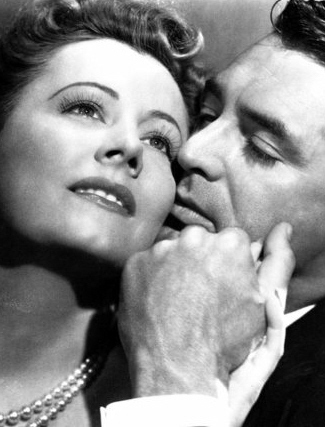 Irene Dunne was Cary Grant’s favorite actress for more than just her perfume and it showed. I am of the opinion that she was also his greatest onscreen partner. Hopefully, I’ll be able to explain why. Garson Kanin’s, My Favorite Wife doesn’t quite measure up to The Awful Truth. The script is a bit weaker. But in truth, who cares. There’s still plenty of the lively wit and witty back-talk well stylized for speed to match the talents of the two stars. 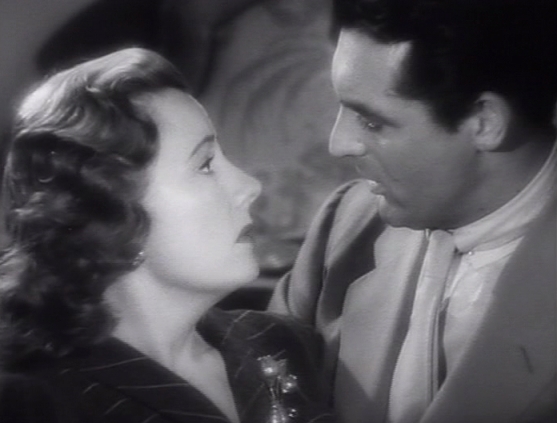 Irene Dunne and Cary Grant onscreen together in this film are magical just as in its predecessor. There’s a certain chemistry there, a comfort and ease that flows like the greatest of musical arrangements. My Favorite Wife is about a woman who is presumed dead after being stranded on an island after a ship wreck then returns home after seven years to find her husband has re-married. 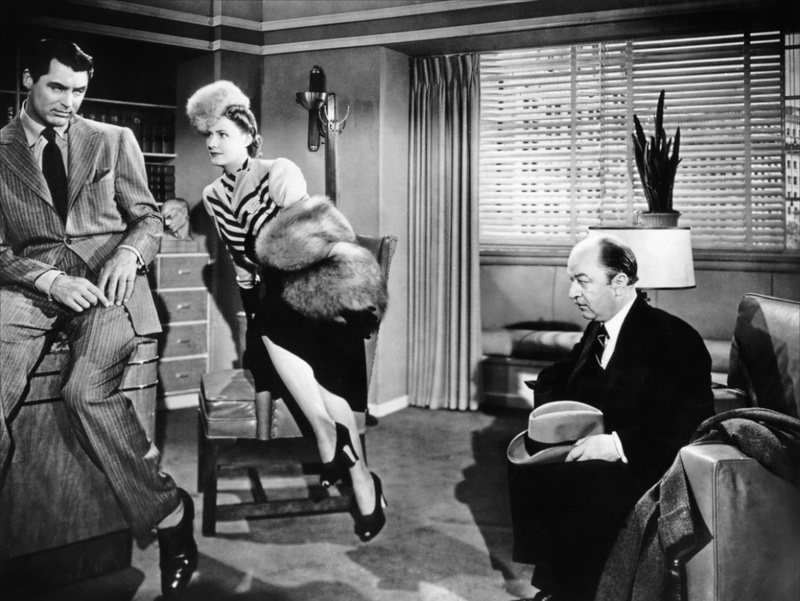 The wife is Ellen (Dunne), the husband, Nick (Grant) and his new wife is the hateful, Bianca, played by Gail Patrick. In a real dilemma, Nick has to find a way to tell his bride, Bianca that his wife, Ellen, who he still loves and with whom he has two children, is not dead after all. 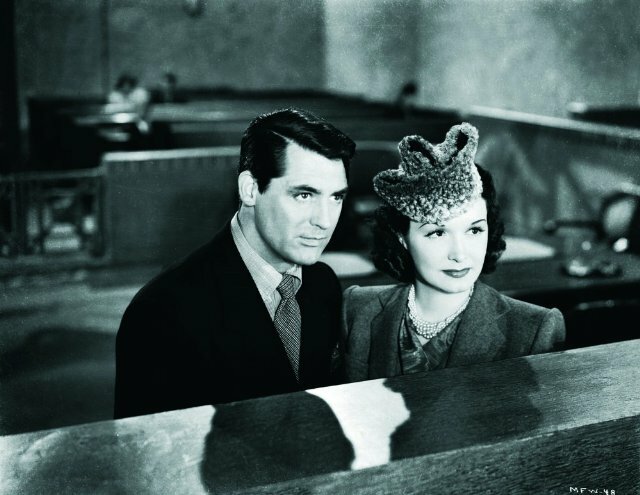 Nick has a very hard time facing up to the truth so Bianca assumes he has psychological problems because he’s acting so zany, made obvious by Cary Grant’s great gift for physical comedy. Bianca, by the way, has absolutely no chance against Ellen. Let’s just get that out of the way. While Nick struggles to find the perfect moment to let his bride know their marriage is worthless, he discovers that his wife was stranded on the island for seven years with Steven Burkett (Randolph Scott), a studly, athletic type who she calls Adam to his Eve. Naturally crazed by jealousy, Nick is more preoccupied with getting to the bottom of the “nature” of their seven years alone on the island, rather than telling his increasingly annoying new bride that they’re not really married. The supporting cast is great in this film but it’s the scenes between Dunne and Grant that make My Favorite Wife worth watching over and over again. Dunne has this wonderful, giddy mocking laugh that matches perfectly with Grant’s awkward and funny reactions. She has an electricity, an allure that bewilders him and makes him particularly susceptible to her charms whenever he’s in close proximity. He can’t resist her magnetism and we can’t resist them together. They just play beautifully opposite each other – relaxed, respectful, playful irreverence. Garson Kanin obviously saw this because in this sense, he allowed a continuation of what made The Awful Truth so wonderful so the opportunity to see them “go at it” are numerous. It’s gold to behold. The charm of My Favorite Wife lasts to the very end, an ending, I might add, very similar to that of The Awful Truth. And again I say, who cares. I’d be very happy to watch outtakes for days of Dunne and Grant exchanges. Those looks and glances. Her come hither stares he’s helpless against. The Grant double-takes as she throws out one snide comment after another. That’s it. Watch this! Watch them! 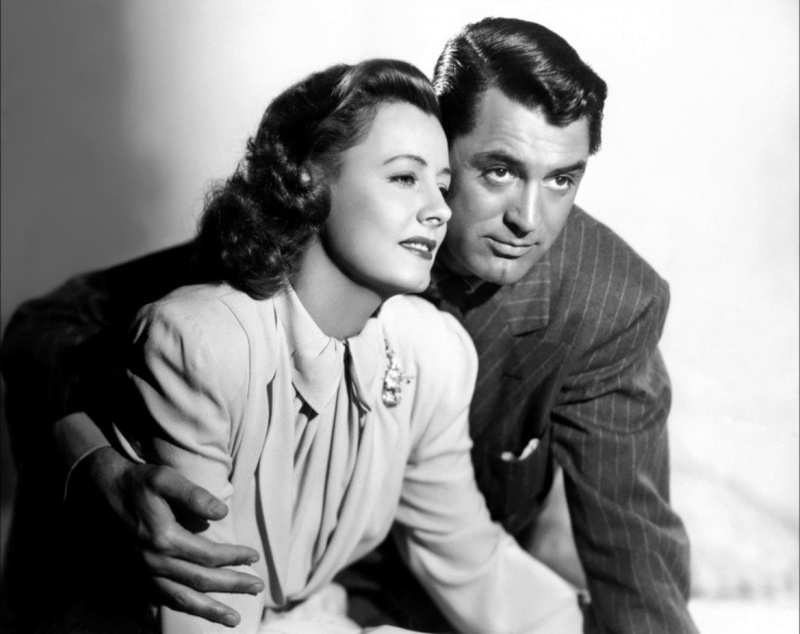 …This “Penny Serenade” is the kind of music a man plays on a woman’s heart-strings..
A year after making My Favorite Wife, Irene Dunne and Cary Grant reunited for their third and final film, George Stevens’, Penny Serenade. I have a huge soft spot for this film as it’s one of the first I ever saw in my life. 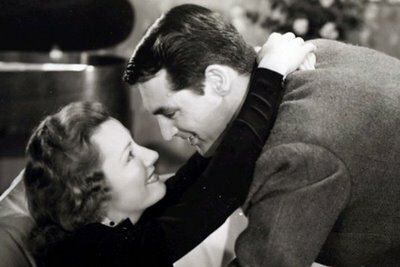 Before I knew who Cary Grant was, before I ever recognized Irene Dunne, I was in love with Penny Serenade. I’m not quite sure how to describe this film. It’s a bona fide multiple-hanky movie but it is also very charming. There are many scenes where the fabulous Grant and Dunne comedic genius shines through. If you haven’t seen this and might, be warned spoilers lay ahead. 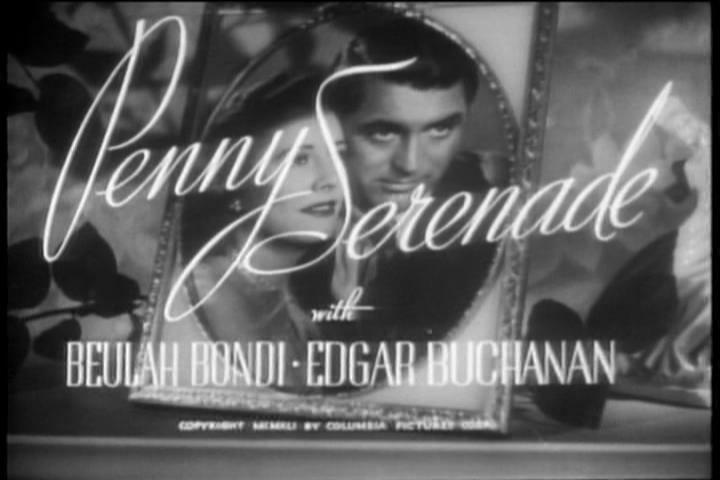 Penny Serenade takes quite a leap from the screwball comedies that were Grant and Dunne’s first two outings. Here we have a melodrama about the trials and tribulations of a couple who struggle to stay together. On their journey they encounter serious adversity and deep joy. Life. As the film opens, Julie Gardner Adams (Dunne) reflects on her past as she listens to a recording of “Penny Serenade.” She has decided to leave her husband, Roger Adams (Grant) and through these recordings we are shown their complete story through flashbacks. The songs mark episodes in the action from records from their collection. I am hooked from the get-go in this. Music has a wonderful way of evoking memories and emotions. It is used beautifully in this film, the songs that guide the story, what brought them together and, to some degree, what keeps them tied to each other – reminders of all they’ve shared. As Julie plays each recording throughout, the camera pans in on the record, spinning its wonderful sound, which then fades into the specific memory, the time in their life together. Those memories start from the day Julie and Roger meet, as they make eye contact through the window of the music store she works in. Unable to resist, Roger goes into the store and asks that she play songs for him. He walks out of the store with her and 27 records he bought even though he has no victrola. So romantic. Makes me wish iPods and music downloads didn’t exist. On through their courtship and marriage we go. Deeply in love, financial troubles and dreams – hers, the dream that makes the film. To have a baby. Tragedy strikes along the way and she is unable to bear her own child. With the help of Apple Jack, the couple’s best friend, employee and surrogate everything (played wonderfully by Edgar Buchanan), the couple agrees to adopt. They have a specific list in mind pertaining to the “perfect” child they want – a boy, two years old with curly hair. They get a 6-week-old baby girl. One they fall in love with immediately. They name her Trina. As is the case with all adoptions, Trina is given to the couple on a one-year probationary period during which time they are frequently visited to ensure the child is properly cared for. There’s no worry there. She is loved. 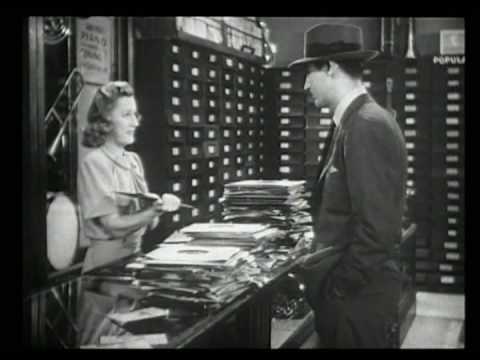 But just as the time approaches when they are to attend the hearing to sign the final adoption papers, Miss Oliver from the adoption agency, played by Beulah Bondi, learns that Roger’s printing business has folded. He has no income. The day comes and Roger and Miss Oliver go to meet the judge. There is no way they will be able to keep the child in a home that cannot provide for her. But Roger pleads with the judge in a scene that Cary Grant knocks out of the park, an Oscar-worthy performance. Voice cracking, heavy with emotion , he pleads with the judge, he and Julie are the only parents Trina has ever known. I won’t go into the entire story, except to say it is a story worth seeing. Aside from the film’s emotional punch, and it is deep, there’s also so much charm. The scenes right after Julie and Roger bring baby Trina home, watching as the new, clueless parents stumble about and worry about every little thing are wonderful. Both Grant and Dunne show their mastery of comedy with perfectly orchestrated physicality. Full charm exhibited in heartwarming fashion! They even place the “directions” on how to care for the baby given to them by the adoption agency on a wall to refer to as needed. Apple Jack has to step in to help bathe the baby for the first time as Julie is afraid of drowning her. It’s all so sweet, including the part where he puts talcum powder on Trina as if he’s seasoning a turkey even tossing a little over his shoulder like salt. Yes, Penny Serenade is hard to watch at times. More so on repeated viewings since you know the heartbreak to come. Even loving this film I brace myself. But I am always lost in it as soon as it starts. The nostalgia in the records, the deep love portrayed, and these amazing actors. Again, Grant and Dunne and their wonderful connection – completely believable as a couple going through the best and worst life can throw at them. I might add that the aforementioned magnetism of Dunne and whatever spell she cast on Grant onscreen is ever deeper in this drama. 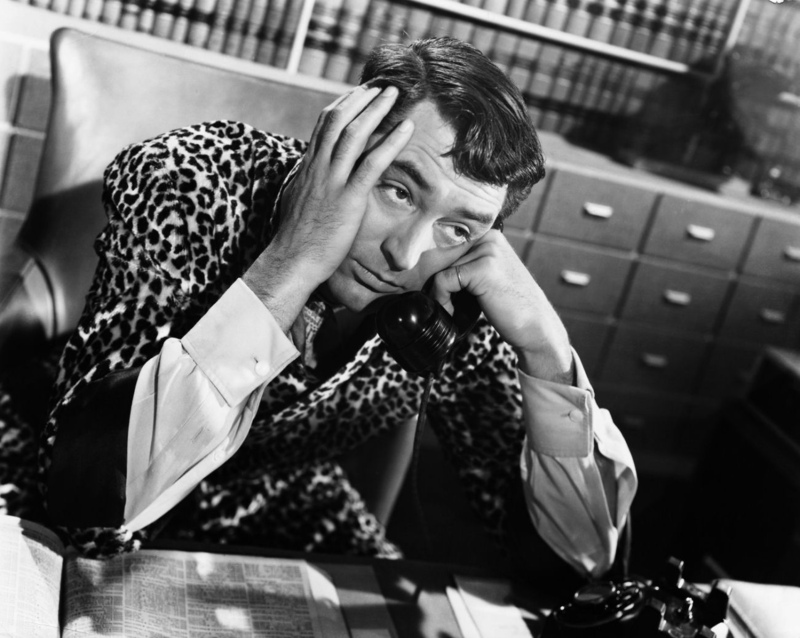 Cary Grant has never seemed more “normal” and ordinary as he is in this film. It’s as though with Dunne he could be Archie Leach, Grant’s self-described alter ego bearing his true birth name. I am always surprised at the lack of attention this film gets in the classic film community. It’s a wonderful, memorable film in which the incomparable Cary gives one, if not the, best performance of his career. He received one of his two Academy Award nominations for Best Actor in a Leading Role for this film. That’s aside from the way it’s filmed and the story told, which are great. And not mentioning the fabulous Grant/Dunne chemistry I keep referring to. I must admit it gets my goat a bit that it’s the two screwball comedies they made together that get all the attention, as great as they are. 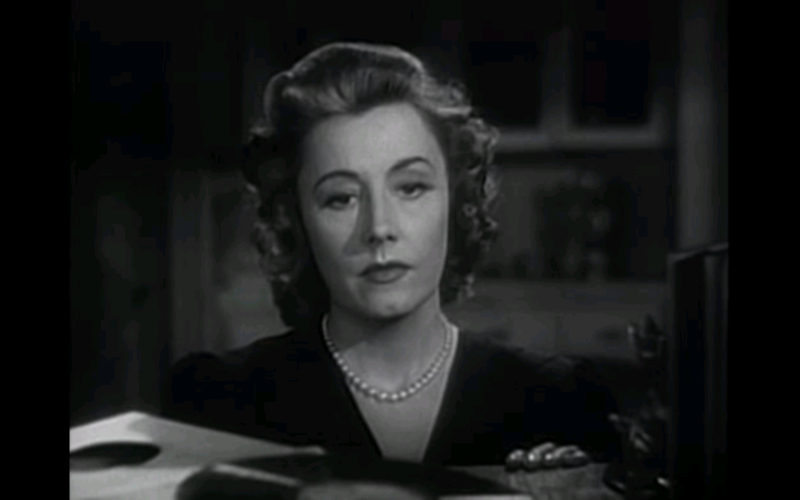 Case in point – Turner Classic Movies, which is dedicating the entire day today to the films of Irene Dunne is showing The Awful Truth and My Favorite Wife but giving no love to Penny Serenade. I know they can’t show all of Ms. Dunne’s films but…well, I just wish they had, that’s all. I just love this film. It’s heartbreaking but it’s also funny, charming and ultimately, joyous and hopeful. It seems I’m in the minority in my views and feelings towards Penny Serenade. When the film was released Time’s reviewer stated, “Grant and Dunne cannot overcome the ten-little-fingers-and-ten-little-toes plot. Written by Morrie Ryskind, produced and directed by George Stevens (Alice Adams), it is too often a moving picture which does not move. Skillful direction saves it from turning maudlin.” Maudlin? I think not! Obviously, I strongly disagree with that review. Penny Serenade does have skillful direction but it also has Grant and Dunne. And it moves me to pieces. 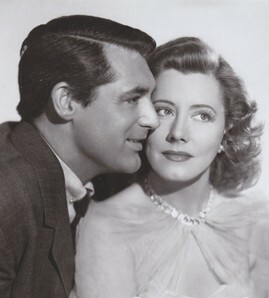 Irene Dunne made many wonderful pictures without Cary Grant too. I don’t want anyone to think she was simply fabulous with him. 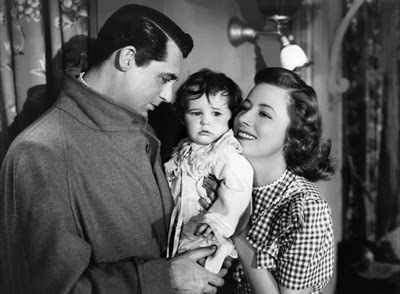 Among her other notables are Leo McCarey’s, Love Affair in 1930 (her favorite) and Michael Curtiz’, Life With Father in 1947, a personal favorite of mine and her only color film. Dunne was discovered for movies while performing in Showboat. She was under contract with RKO Pictures by 1930. Blessed with great range both vocally and in her acting, Dunne started in films as a dramatic actress but was persuaded to do a comedy with a starring role in Theodora Goes Wild, for which she received her second of five Academy Award nominations for Actress in a Leading Role. The film was also a huge hit. I have to thank whoever did the persuading because she’d never have done The Awful Truth if not for that as she didn’t have much liking for comedies. 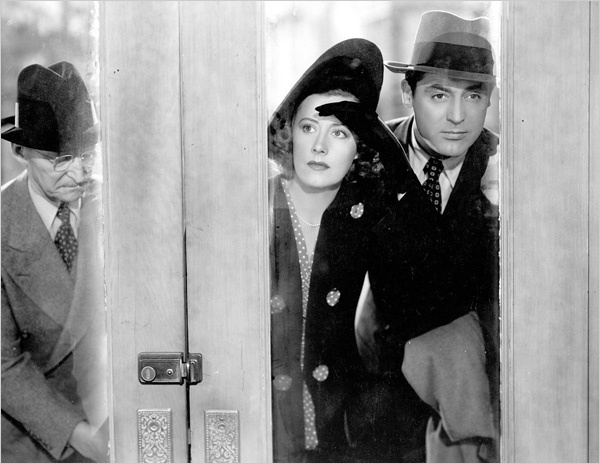 Mentioned above is the fact Irene Dunne received a total of five Academy Award nominations but she won none. That’s not surprising to me. Some of my favorite actors never won Oscars and I’ve certainly disagreed with some who’ve been nominated and lost. But I must say I am flabbergasted Ms. Dunne was never honored by the Academy with an honorary award for her great body of work. As far as I’m concerned they dropped the ball BIG time on that. If five nominations doesn’t warrant special recognition, then a career that produced many memorable performances in comedy and drama certainly should. A singer, dramatic actress and comedienne and later, a woman who dedicated her time and effort to causes that affect our country and the world. 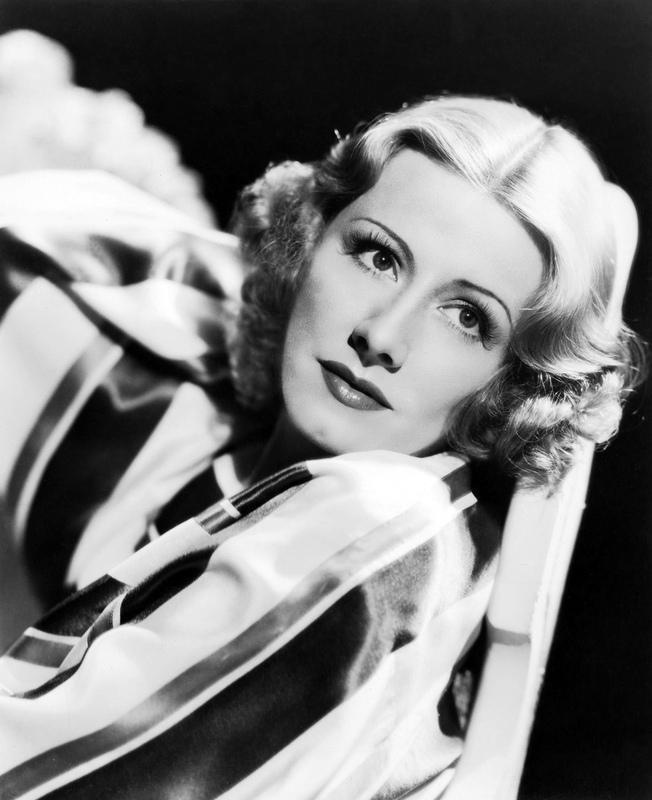 Irene Dunne was one of the greats – of the highest order in all manner of things. I’m not sure there’s anything classic film fans agree with more than with the fact that Cary Grant was an unbelievable talent. And he worked with the greatest of the greats – opposite Katharine Hepburn’s majesty, Ingrid Bergman’s allure, Myrna Loy’s serenity and made an unforgettable onscreen coupling with Rosalind Russell, to name but a few. He could do it all in grand style and with total believability. That he somehow did it all better with Irene Dunne is quite something – testament to her great talent – his greatest costar. 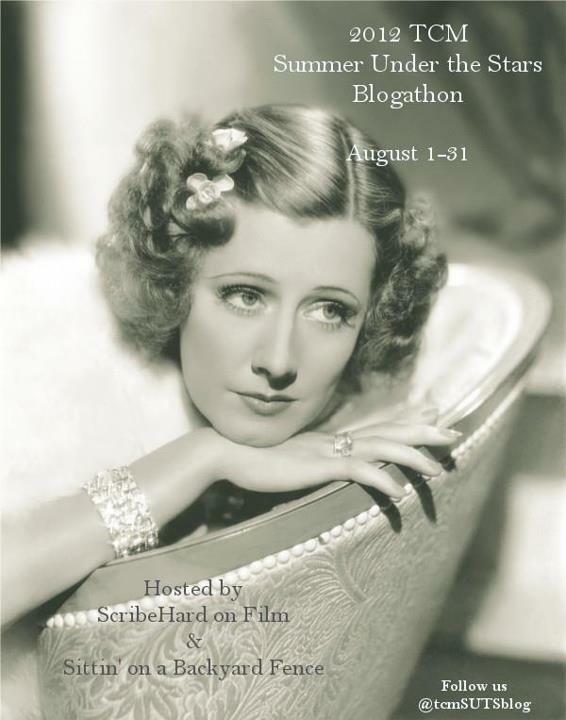 This is my entry on Irene Dunne day to the SUTS blogathon hosted by Michael of Scribehard on Film and Jill of Sittin’ On a Backyard Fence in honor of the great actress. Please go to either of the host sites to read entries by other passionate bloggers. 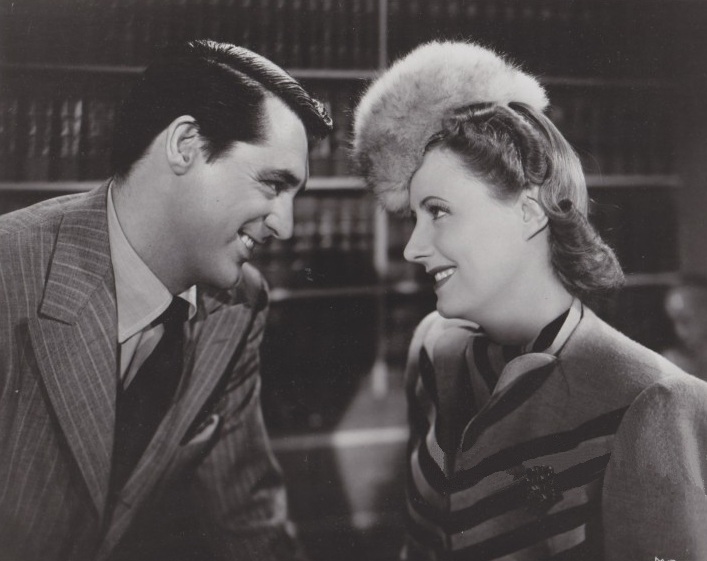 I have always loved the chemistry and the films pairing Cary Grant and Irene Dunne. Why oh WHY only 3 films?!! I watched Penny Serenade for the first time when I was around 14- made me cry. I’m really looking forward to watching these gems. I’m looking forward to seeing My Favorite Wife and The Awful Truth, along with Theodora Goes Wild tomorrow- very much. Another outstanding write-up, Aurora! I want to watch both the Grant and Dunne entries later today. Hope I make it home from work. Can always use a laugh and these two are the best. But wish Penny Serenade would have gotten a little attention. So I gave it. Thanks as always! Well, Kay, who cares what anyone else thinks if you and your excellent taste agree with me! It’s almost as though Grant and Dunne were so wonderful in the two comedies that no one wants to see them in a drama. Well, like you, I have Penny Serenade and absolutely adore it. They are great together in it. Melodramatic or not it’s life, I really wish they’d made more movies together. LOVE Beulah in it as well. She’s so affecting as Oliver. Everything is just perfect in this film and I am putty in its hands! I love Penny Serenade too, and am thrilled that I’m not alone. I have a hard time watching it, you’re right, but it always makes me feel better anyway. I can’t wait for the other two tonight….I adore these two together. It will be the perfect Friday night with Irene and Cary! Once again Aurora, thank you so very much for writing this. 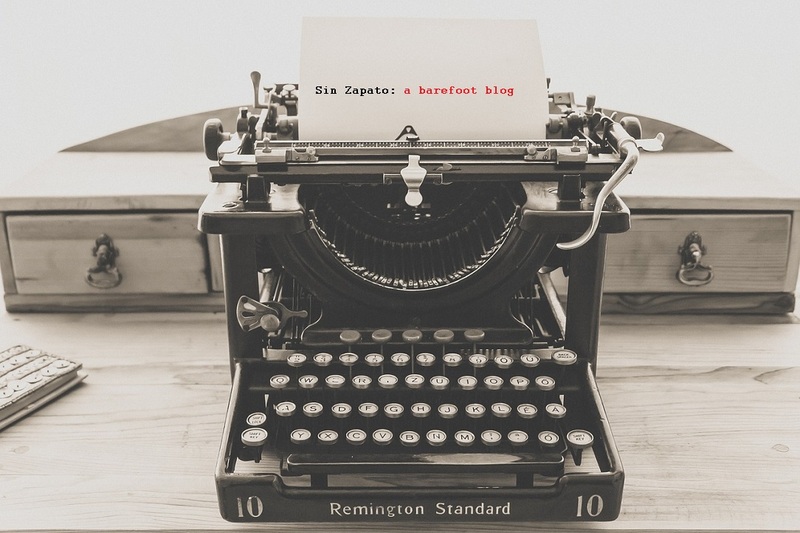 I know it takes a lot of time to write and publish any blog post, but yours all go above and beyond, and they’re all written with such passion. A passion I definitely share, so I REALLY appreciate your writing. Thanks, Sarah – you’re so nice to be so enthusiastic about these posts it means a lot and it much appreciated! They’re fun – no frills – but how I really feel about these movies and people. So much to enjoy. 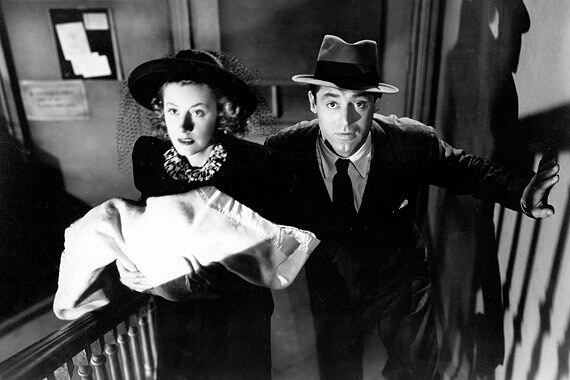 I just finished watching the Grant/Dunne evening on TCM – even more convinced they were made for each other on screen. Thank you for stopping in and for your lovely comments! While I’m not as big a fan of Dunne as you are (there was always something a little too calculated about her for my taste), and I would say Katharine Hepburn was my favorite partner for Grant (based on my love for “Holiday” and “The Philadelphia Story”), I do like all three of these films, particularly “The Awful Truth”. The banter between the two of them is just terrific. I enjoyed, as usual, your write-up of all of these. No argument from me, Sean, that Hepburn and Grant were a great duo. It’s really nonsensical to compare – there’s enough greatness to go around. But I do think there’s a little something special between Grant and Dunne onscreen. Just finished watching their comedies on TCM – even more convinced. Thank you, as always, for stopping in and commenting. Always appreciated! Three films together is far too few! You’ve done a nice job of recapping them here. YES! Many more needed from these two together. Hollywood FAIL! What a lovely tribute to these three great films Cary and Irene costarred in. I think Cary just meshed so well with so many of his costars, Hepburn, Grace Kelly. Ingrid Bergman and of course Irene Dunne . Thank heavens Irene was persuaded to try comedy. She had only done dramas and musicals in the early 30s. I wish she and Cary had done another drama together.They are so moving in Penny Serenade. 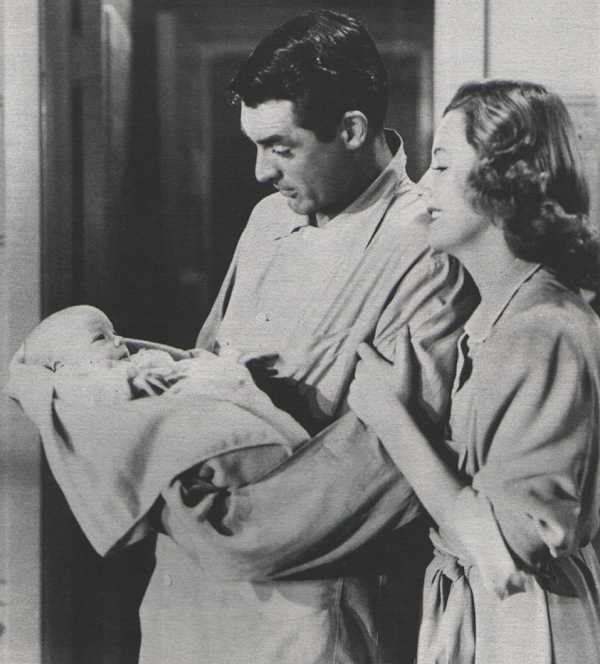 Cary and Irene seemed ideal together. Thanks again for your lovely comments, Vienna. You can see what I think about Irene as a comic actress, definitely one of the best. It would have been a great loss indeed if she’d decided not to do comedy! And with Grant THE ideal team! 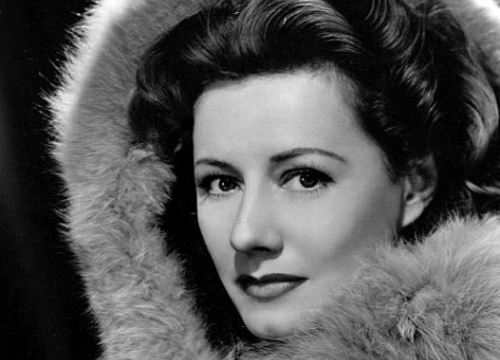 I like Irene Dunne’s acting and she is a pretty woman but something about her upper lip/mouth is unpleasant. I think her upper lip is noticeably narrow and gives her a mean look. I’m sure she was a nice gal, but I think her mouth detracts from her acting. LOL! That’s fair, I guess. I honestly never noticed. Although now that you mention it, it may add to the fact that she has a “snooty” sense but did her comedy broad, which may have added to it being so effective. To me anyway. She was a hoot to me. I loved your post. 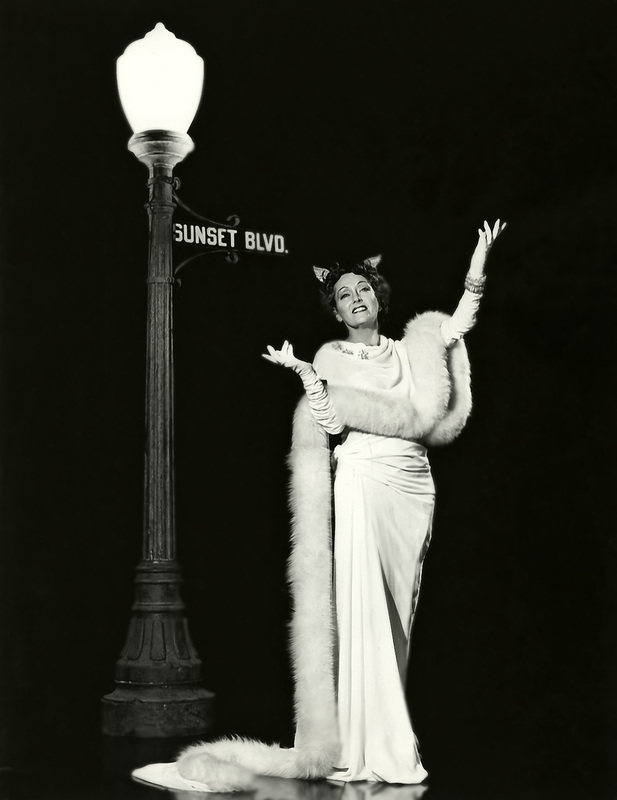 Irene Dunne was an incredible talent and woman. When teamed with Cary Grant there was no equal to their onscreen chemistry. I found your blog after watching Irene Dunne in The Love Affair and once again wanting to know who this amazing actress was. What an ability of being so alive and balancing mastery of nuance and gesture. Every time I see her in a film I am just entranced with her portrayal and not thinking of where I should be focussing next or that I am even watching something made years ago. I know know very little of her life but it does seem that she had her priorities straight and the acting could be done in a straight forward and clean manner and since she was obviously brilliant, the combo is dynamite. I agree with you that she is the gem overlooked and it seemed to be of no concern to her during her life, wow what a classy person, a true artist. 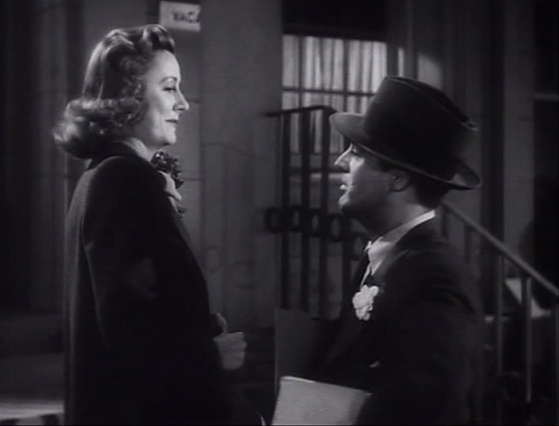 I love them together, but what is incredible about Irene Dunne is that she only had a studio contract for a few years and never signed another one afterward. She was never out of work even though she was a free agent. This is how great she was and how much they wanted her in their films. They wanted her instead of Bette Davis, who wanted the roles. I love Dunne with Boyer as well. He too was a free agent and Grant became a free agent too. They all had something in common! 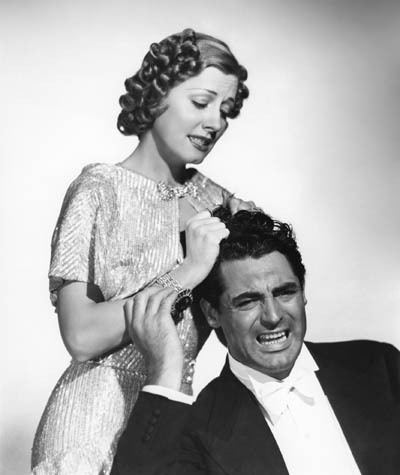 You summed up Cary Grant and Irene Dunne in this beautiful tribute. I too am shocked that Ms. Dunne never got a lifetime achievement award. She was fabulous. I am watching Penny Serenade right now as I write this. Thank you for this page and the excellent photos! Even when he worked with a lion; Bringing up baby…he was an athelete pulled off those stunts, plus he was young then. His background gave him the goods to be physical in his comedies and he excelled at it. You couldn’t be any more right! 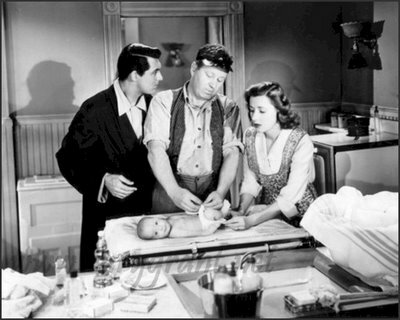 It’s a great film starring a great group of actors, Cary and Irene just get more screen time. Anyway, thanks for the remembrance as I re-watch this absolutely wonderful film featuring Cary and Irene at their very best.